leaving the house with very small kitchen, dining and living rooms, and with an awkward bathroom off the kitchen and well away from the bedrooms. The clients initially came to Equinox Design with a more elaborate concept layout, which had to be scaled back during the pricing process. However, the proposed alterations will still transform the house into a much more practical and enjoyable home. The new plan adds only 12m² of floor area, but completely revises the layout to create a large open plan lounge/dining/kitchen, a main bedroom with ensuite, an entry with coat cupboard, and a main bathroom near the other two bedrooms. The first (1960s) addition, to the northeast, has been set at a lower level to the main floor. The stairs from this level are badly positioned and will be moved slightly to provide a more usable lounge area, as can be seen in the plans. Due to budget constraints, the redevelopment will be broken into two stages. The first will involve all the changes shown for the upper floor including the two very small additions. The second stage will be an extension of the lower split-level to the east (currently deck), converting this space into the main bedroom and making room for an ensuite and entry. Existing and proposed views from the east. The exterior appearance will also benefit greatly from the renovation, particularly by the replacement of the lower level’s gable roof with a mono-pitch one to match the main roof. Also, the roof of the original ‘bach’ portion of the house will reconstructed to match that of the earlier addition. Existing and proposed sketch views from east. From this angle the changes in roof line are more apparent, as is the small addition to the side of the house. 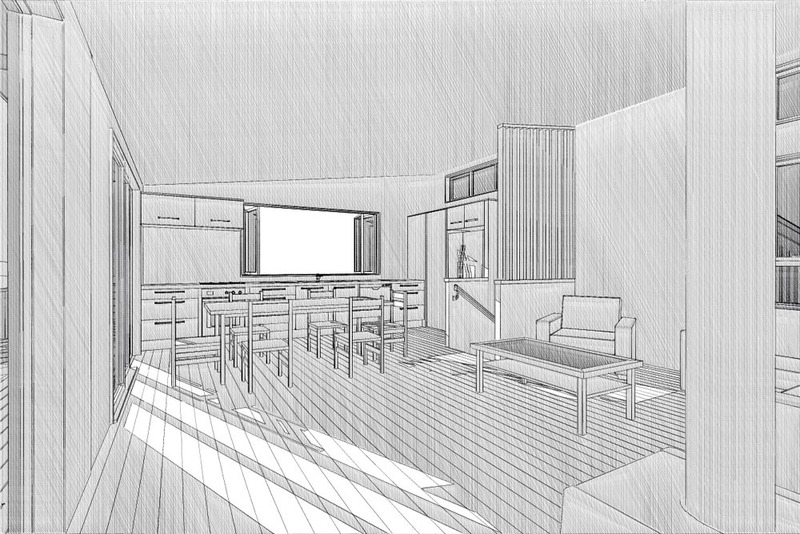 In the main living space, a grid of beams with low ceilings will be removed and replaced with sloping ceilings with clerestory windows, enhancing the opening up of this area and matching the existing sloping ceiling and clerestory window in what was the main bedroom. Interior view of main living area from passageway. 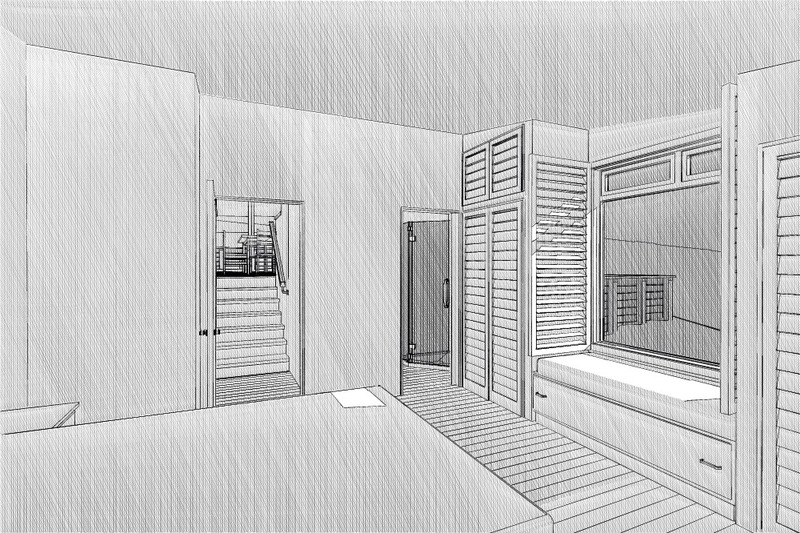 Interior of proposed main bedroom. This page will be updated as the project progresses.